Wernicke encephalopathy (WE), also Wernicke’s encephalopathy is the presence of neurological symptoms caused by biochemical lesions of the central nervous system after exhaustion of B-vitamin reserves, in particular thiamine (vitamin B1). The condition is part of a larger group of thiamine deficiency disorders, that includes beriberi in all its forms, and alcoholic Korsakoff syndrome. When it occurs simultaneously with alcoholic Korsakoff syndrome it is known as Wernicke–Korsakoff syndrome. Classically, Wernicke encephalopathy is characterised by the triad – ophthalmoplegia, ataxia, and confusion. Around 10% of patients exhibit all three features, and other symptoms may also be present. While it is commonly regarded as a condition peculiar to malnourished people with alcohol misuse, it can be caused by a variety of diseases. It is treated with thiamine supplementation, which can lead to improvement of the symptoms and often complete resolution, particularly in those where alcohol misuse is not the underlying cause. Often other nutrients also need to be replaced, depending on the cause. Among the frequently altered functions are the cardio circulatory. There may be tachycardia, dyspnea, chest pain, orthostatic hypotension, changes in heart rate and blood pressure. The lack of thiamine sometimes affects other major energy consumers, the myocardium, and also patients may have developed cardiomegaly. Heart failure with lactic acidosis syndrome has been observed. Cardiac abnormalities are an aspect of the WE, which was not included in the traditional approach, and are not classified as a separate disease. Brainstem tegmentum. – Ocular: pupillary changes. Extraocular muscle palsy; gaze palsy: nystagmus. 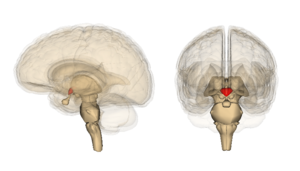 Hypothalamus. Medulla: dorsal nuc. of vagus. – Autonomic dysfunct. : temperature; cardiocirculatory; respiratory. Medulla: vestibular region. Cerebellum. – Ataxia. Dorsomedial nuc. of thalamus. Mammillary bodies. – Amnestic syndrome for recent memory. Korsakoff’s syndrome, characterised by memory impairment, confabulation, confusion and personality changes, has a strong and recognised link with WE. A very high percentage of patients with Wernicke-Korsakoff syndrome also have peripheral neuropathy, and many alcoholics have this neuropathy without other neurologic signs or symptoms. Korsakoff´s occurs much more frequently in WE due to chronic alcoholism. It is uncommon among those who do not consume alcohol abusively. Up to 80% of WE patients who abuse alcohol develop Korsakoff’s syndrome. In Korsakoff’s, is usually observed atrophy of the thalamus and the mammillary bodies, and frontal lobe involvement. In a study, half of Wernicke-Korsakoff cases had good recovery from the amnesic state, which may take from 2 months to 10 years. this disease may even occur in some people with normal, or even high blood thiamine levels, are people with deficiencies in intracellular transport of this vitamin. Selected genetic mutations, including presence of the X-linked transketolase-like 1 gene, SLC19A2 thiamine transporter protein mutations, and the aldehyde dehydrogenase-2 gene, which may predispose to alcoholism. The APOE epsilon-4 allele, involved in Alzheimer’s disease, may increase the chance of developing neurological symptoms. Despite its name, WE is not related to Wernicke’s area, a region of the brain associated with speech and language interpretation. Other supplements may also be needed, including: cobalamin, ascorbic acid, folic acid, nicotinamide, zinc, phosphorus (dicalcium phosphate) and in some cases taurine, especially suitable when there cardiocirculatory impairment. Patient-guided nutrition is suggested. In patients with Wernicke-Korsakoff syndrome, even higher doses of parenteral thiamine are recommended. Concurrent toxic effects of alcohol should also be considered. Wernicke’s lesions were observed in 0.8 to 2.8% of the general population autopsies, and 12.5% of alcoholics. This figure increases to 35% of alcoholics if including cerebellar damage due to lack of thiamine. ^ a b c [unreliable medical source?] Sullivan EV, Fama R (June 2012). “Wernicke’s encephalopathy and Korsakoff’s syndrome revisited”. Neuropsychology Review. 22 (2): 69–71. doi:10.1007/s11065-012-9205-2. PMC 4723427. PMID 22588370. ^ a b Cook CC (2000). “Prevention and treatment of Wernicke-Korsakoff syndrome”. Alcohol and Alcoholism. 35 (Supplement 1): 19–20. doi:10.1093/alcalc/35.Supplement_1.19. PMID 11304070. ^ a b c d e f g h i j k l m Galvin R, Bråthen G, Ivashynka A, Hillbom M, Tanasescu R, Leone MA (December 2010). “EFNS guidelines for diagnosis, therapy and prevention of Wernicke encephalopathy”. European Journal of Neurology. 17 (12): 1408–18. doi:10.1111/j.1468-1331.2010.03153.x. PMID 20642790. ^ Isenberg-Grzeda E, Kutner HE, Nicolson SE (2012). “Wernicke-Korsakoff-syndrome: under-recognized and under-treated”. Psychosomatics. 53 (6): 507–16. doi:10.1016/j.psym.2012.04.008. PMID 23157990. ^ a b c d e f g h i j Lough ME (June 2012). “Wernicke’s encephalopathy: expanding the diagnostic toolbox”. Neuropsychology Review. 22 (2): 181–94. doi:10.1007/s11065-012-9200-7. PMID 22577001. ^ a b c d Harper, CG; Giles, M; Finlay-Jones, R (April 1986). “Clinical signs in the Wernicke-Korsakoff complex: a retrospective analysis of 131 cases diagnosed at necropsy”. Journal of Neurology, Neurosurgery, and Psychiatry. 49 (4): 341–5. doi:10.1136/jnnp.49.4.341. PMC 1028756. PMID 3701343. ^ Mumford, C. J. (1989). “Papilloedema delaying diagnosis of Wernicke’s encephalopathy in a comatose patient”. Postgraduate Medical Journal. 65 (764): 371–3. doi:10.1136/pgmj.65.764.371. PMC 2429353. PMID 2608577. ^ Chitra S, Lath KV (May 2012). “Wernicke’s encephalopathy with visual loss in a patient with hyperemesis gravidarum”. The Journal of the Association of Physicians of India. 60: 53–6. PMID 23029727. ^ a b Truswell AS (June 2000). “Australian experience with the Wernicke-Korsakoff syndrome”. Addiction. 95 (6): 829–32. doi:10.1046/j.1360-0443.2000.9568291.x. PMID 10946433. ^ Flabeau O, Foubert-Samier A, Meissner W, Tison F (August 2008). “Hearing and seeing: Unusual early signs of Wernicke encephalopathy”. Neurology. 71 (9): 694. doi:10.1212/01.wnl.0000324599.66359.b1. PMID 18725598. ^ Jethava A, Dasanu CA (2012). “Acute Wernicke encephalopathy and sensorineural hearing loss complicating bariatric surgery”. Connecticut Medicine. 76 (10): 603–5. PMID 23243762. ^ Meierkord H, Boon P, Engelsen B, et al. (March 2010). “EFNS guideline on the management of status epilepticus in adults”. European Journal of Neurology. 17 (3): 348–55. doi:10.1111/j.1468-1331.2009.02917.x. PMID 20050893. ^ Kondo, K.; Fujiwara, M.; Murase, M.; Kodera, Y.; Akiyama, S.; Ito, K.; Takagi, H. (1996). “Severe Acute Metabolic Acidosis and Wernicke’s Encephalopathy Following Chemotherapy with 5-Fluorouracil and Cisplatin: Case Report and Review of the Literature”. Japanese Journal of Clinical Oncology. 26 (4): 234–6. doi:10.1093/oxfordjournals.jjco.a023220. PMID 8765181. ^ Becker JT, Furman JM, Panisset M, Smith C (1990). “Characteristics of the memory loss of a patient with Wernicke-Korsakoff’s syndrome without alcoholism”. Neuropsychologia. 28 (2): 171–9. doi:10.1016/0028-3932(90)90099-A. PMID 2314572. ^ Zhang G, Ding H, Chen H, et al. (January 2013). “Thiamine nutritional status and depressive symptoms are inversely associated among older Chinese adults”. Journal of Nutrition. 143 (1): 53–8. doi:10.3945/jn.112.167007. PMC 3521461. PMID 23173173. ^ Worden RW, Allen HM (2006). “Wernicke’s encephalopathy after gastric bypass that masqueraded as acute psychosis: a case report”. Current Surgery. 63 (2): 114–6. doi:10.1016/j.cursur.2005.06.004. PMID 16520112. ^ Jiang W, Gagliardi JP, Raj YP, Silvertooth EJ, Christopher EJ, Krishnan KR (January 2006). “Acute psychotic disorder after gastric bypass surgery: differential diagnosis and treatment”. American Journal of Psychiatry. 163 (1): 15–9. doi:10.1176/appi.ajp.163.1.15. PMID 16390883. ^ Lindberg MC, Oyler RA (April 1990). “Wernicke’s encephalopathy”. American Family Physician. 41 (4): 1205–9. PMID 2181837. ^ Mann MW, Degos JD (1987). “L’hypothermie dans l’encéphalopathie de Wernicke” [Hypothermia in Wernicke’s encephalopathy]. Revue Neurologique (in French). 143 (10): 684–6. PMID 3423584. INIST:7514445. ^ Rohkamm, Reinhard (2004). “Hemodynamic abnormalities”. Color Atlas of Neurology. p. 148. ISBN 978-1-58890-191-0. ^ Ishiko T, Taguchi T, Takeguchi M, Saito H, Nanri K (September 2009). “Wernicke脳症，亜急性連合性脊髄変性症，衝心脚気をきたしたビタミンB1，B12，葉酸欠乏症の1例” [Case of Wernicke’s encephalopathy and subacute combined degeneration of the spinal cord due to vitamin deficiency showing changes in the bilateral corpus striatum and cardiac arrest due to beriberi heart disease]. Brain and Nerve (in Japanese). 61 (9): 1069–73. PMID 19803406. ^ Harper C, Fornes P, Duyckaerts C, Lecomte D, Hauw JJ (March 1995). “An international perspective on the prevalence of the Wernicke-Korsakoff syndrome”. Metabolic Brain Disease. 10 (1): 17–24. doi:10.1007/BF01991779. PMID 7596325. ^ a b Vasconcelos, M. M.; Silva, K. P.; Vidal, G.; Silva, A. F.; Domingues, R. C.; Berditchevsky, C. R. (1999). “Early diagnosis of pediatric Wernicke’s encephalopathy”. Pediatric Neurology. 20 (4): 289–294. doi:10.1016/s0887-8994(98)00153-2. PMID 10328278. ^ Fattal-Valevski A, Kesler A, Sela BA, et al. (February 2005). “Outbreak of life-threatening thiamine deficiency in infants in Israel caused by a defective soy-based formula”. Pediatrics. 115 (2): e233–8. doi:10.1542/peds.2004-1255. PMID 15687431. ^ a b c d e f g h i j k l m n o Sechi G, Serra A (May 2007). “Wernicke’s encephalopathy: new clinical settings and recent advances in diagnosis and management”. Lancet Neurology. 6 (5): 442–55. doi:10.1016/S1474-4422(07)70104-7. PMID 17434099. ^ a b c Thomson AD, Guerrini I, Marshall EJ (June 2012). “The evolution and treatment of Korsakoff’s syndrome: out of sight, out of mind?”. Neuropsychology Review. 22 (2): 81–92. doi:10.1007/s11065-012-9196-z. PMC 3545191. PMID 22569770. ^ L Ng Kv; Nguyễn LT (April 2013). “The role of thiamine in HIV infection”. The International Journal of Infectious Diseases. 17 (4): e221–7. doi:10.1016/j.ijid.2012.11.019. PMID 23274124. ^ Rosen A, van Kuilenburg A, Assmann B, Kuhlen M, Borkhardt A (May 2011). “Severe encephalopathy, lactic acidosis, vegetative instability and neuropathy with 5-Fluorouracil treatment – pyrimidine degradation defect or beriberi?”. Case Reports in Oncology. 4 (2): 371–6. doi:10.1159/000328803. PMC 3177792. PMID 21941485. ^ Martin PR, Singleton CK, Hiller-Sturmhöfel S (2003). “The role of thiamine deficiency in alcoholic brain disease”. Alcohol Research & Health. 27 (2): 134–42. PMID 15303623. ^ Soukoulis V, Dihu JB, Sole M, et al. (October 2009). “Micronutrient deficiencies an unmet need in heart failure”. Journal of the American College of Cardiology. 54 (18): 1660–73. doi:10.1016/j.jacc.2009.08.012. PMID 19850206. ^ Lee JH, Jarreau T, Prasad A, Lavie C, O’Keefe J, Ventura H (2011). “Nutritional assessment in heart failure patients”. Congestive Heart Failure. 17 (4): 199–203. doi:10.1111/j.1751-7133.2011.00239.x. PMID 21790970. ^ Hirsch JA, Parrott J (2012). “New considerations on the neuromodulatory role of thiamine”. Pharmacology. 89 (1–2): 111–6. doi:10.1159/000336339. PMID 22398704. ^ Hazell AS (2009). “Astrocytes are a major target in thiamine deficiency and Wernicke’s encephalopathy”. Neurochemistry International. 55 (1–3): 129–35. doi:10.1016/j.neuint.2009.02.020. PMID 19428817. ^ Hazell AS, Todd KG, Butterworth RF (June 1998). “Mechanisms of neuronal cell death in Wernicke’s encephalopathy”. Metabolic Brain Disease. 13 (2): 97–122. doi:10.1023/A:1020657129593. PMID 9699919. ^ a b Zuccoli G, Pipitone N (February 2009). “Neuroimaging findings in acute Wernicke’s encephalopathy: review of the literature”. American Journal of Roentgenology. 192 (2): 501–8. doi:10.2214/AJR.07.3959. PMID 19155417. ^ Caine, D; Halliday, G M; Kril, J J; Harper, C G (1 January 1997). “Operational criteria for the classification of chronic alcoholics: identification of Wernicke’s encephalopathy”. Journal of Neurology, Neurosurgery, and Psychiatry. 62 (1): 51–60. doi:10.1136/jnnp.62.1.51. PMC 486695. PMID 9010400. ^ Hegde, AN; Mohan, S; Lath, N; Lim, CC (2011). “Differential diagnosis for bilateral abnormalities of the basal ganglia and thalamus”. Radiographics : a review publication of the Radiological Society of North America, Inc. 31 (1): 5–30. doi:10.1148/rg.311105041. PMID 21257930. ^ Iwamoto Y, Okuda B, Miyata Y, Tachibana H, Sugita M (June 1994). “[Beneficial effect of steroid pulse therapy on Wernicke-Korsakoff syndrome due to hyperemesis gravidarum]”. Rinsho Shinkeigaku. 34 (6): 599–601. PMID 7955722. ^ a b Thomson AD, Cook CC, Touquet R, Henry JA (2002). “The Royal College of Physicians report on alcohol: guidelines for managing Wernicke’s encephalopathy in the accident and Emergency Department”. Alcohol and Alcoholism. 37 (6): 513–21. doi:10.1093/alcalc/37.6.513. PMID 12414541. ^ Lourenço R, Camilo ME (2002). “Taurine: a conditionally essential amino acid in humans? An overview in health and disease” (PDF). Nutrición Hospitalaria. 17 (6): 262–70. PMID 12514918. ^ Iwamoto Y, Okuda B, Miyata Y, Tachibana H, Sugita M (June 1994). “[Beneficial effect of steroid pulse therapy on Wernicke-Korsakoff syndrome due to hyperemesis gravidarum]”. Rinsho Shinkeigaku (in Japanese). 34 (6): 599–601. PMID 7955722. ^ Harper, C (March 1979). “Wernicke’s encephalopathy: a more common disease than realised. A neuropathological study of 51 cases”. Journal of Neurology, Neurosurgery, and Psychiatry. 42 (3): 226–31. doi:10.1136/jnnp.42.3.226. PMC 490724. PMID 438830. ^ Lana-Peixoto MA, Dos Santos EC, Pittella JE (September 1992). “Coma and death in unrecognized Wernicke’s encephalopathy. An autopsy study”. Arquivos de Neuro-Psiquiatria. 50 (3): 329–33. doi:10.1590/S0004-282X1992000300012. PMID 1308411. ^ Dias FM, Silva DM, Doyle FC, Ribeiro AM (January 2013). “The connection between maternal thiamine shortcoming and offspring cognitive damage and poverty perpetuation in underprivileged communities across the world”. Medical Hypotheses. 80 (1): 13–6. doi:10.1016/j.mehy.2012.09.011. PMID 23098375. ^ a b Xin, Y.; Wan, D. H.; Chu, Q.; Li, A. M.; Gao, X. J. (2011). “Severe sepsis as an initial presentation in children with Wernicke’ s encephalopathy: Report of a case and literature review”. Zhonghua Er Ke Za Zhi. 49 (8): 612–616. PMID 22093426. ^ Passemard, S.; Kaindl, A. M.; Verloes, A. (2013). “Microcephaly”. Pediatric Neurology Part I. Handbook of Clinical Neurology. 111. pp. 129–141. doi:10.1016/B978-0-444-52891-9.00013-0. ISBN 9780444528919. PMID 23622158.